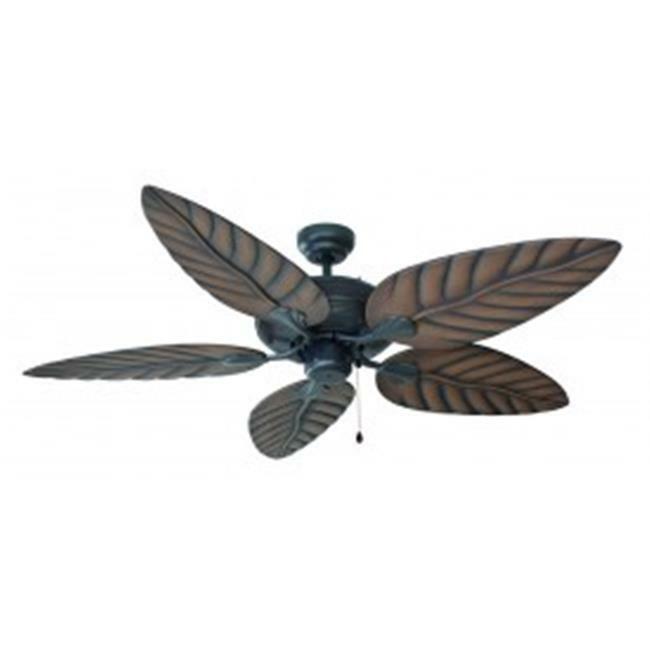 The Design House 154104 Martinique 52-Inch 5-Blade Ceiling Fan features a tropical design and an oil rubbed bronze finish. Perfect for any indoor or outdoor space. Use the pull chain to control your 3-speed motor and toggle between three different speed settings. The (5) leaf-shaped fan blades have a chestnut finish. Downrod only mount great for high ceilings. Run the motor in reverse to help conserve energy costs during all seasons. Blades can be run on the normal setting during the summer to create cooling air flow and on reverse in the winter to re-circulate warm air from the ceiling. This fan is UL listed rated for 120-volts and is approved for damp areas. Motor is light kit adaptable. Measuring 52-inches this fixture adds a dramatic accent to any home or condominium. The Design House 154104 Martinique 52-Inch 5-Blade Ceiling Fan comes with a 10-year limited that protects against defects in materials and workmanship. Airflow efficiency: 94 CFMW. Watts: 55. Airflow at high speed: 5150 CFM. Blades have a 10-degree pitch. Design House offers products in multiple home decor categories including lighting ceiling fans hardware and plumbing products. With years of hands-on experience Design House understands every aspect of the home decor industry and devotes itself to providing quality products across the home decor spectrum. Providing value to their customers Design House uses industry leading merchandising solutions and innovative programs. Design House is committed to providing high quality products for your home improvement projects.